George by Alex Gino. Grades 4-6. Scholastic Press, August 2015. 195 pages. Reviewed from ARC provided by publisher. Summary: When George's fourth grade class puts on the play Charlotte's Web, she wants nothing more than to play the part of Charlotte. When they read about Charlotte's death in the book, it made George cry, and she knows that she can do justice to this part, this role that means so much to her. George has a secret. A secret that no one knows about - not even her mom or her best friend. And she's hoping that if her classmates and her mom see her playing a girl's part in the play, it might make it easier to tell her secret and easier for them to accept the truth that George has accepted about herself. George is a girl. She is in a boy's body, but she is a girl. It won't be easy to convince her teacher and classmates that she should play Charlotte. It might be impossible. But George has to try. This is a book that's been talked about a lot (at least in my bloggity teacher/librarian circles) and it's certainly one that people should know about. We need more books about the GLBT experience and this hits the right notes for upper elementary students. 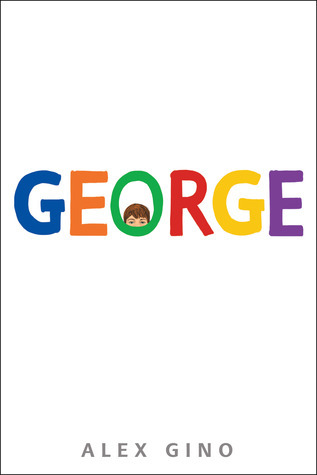 The experience of being in a class play is something that many kids will identify with, and I think George is a heroine that kids will root for. Because the author immediately starts out using the pronoun "she" to describe George, it was impossible for me to see George as anything but what she is - a girl. This is an effective way to introduce our protagonist, and as the narrative continues, the reader starts to understand the problem: that George, a girl, is living in a boy's body. I appreciated that George has done her research and that the word "transgender" is used in this book, along with some information about what that means. The information is not presented in a didactic way, and it definitely makes sense that a fourth grader curious about what she is experiencing would have done some research and be at least somewhat knowledgeable about what is going on. I also appreciated the range of characters in the book, some surprisingly supportive and others not as supportive of George's wishes. I do not have firsthand experience to speak to the authenticity of this, but it felt realistic to me. This book is an important addition to our library shelves and deserves to be widely read and shared. Don't miss it. For readers interested in reading more about the transgender experience in middle-grade lit, check out Gracefully Grayson by Ami Polonsky. The tone of this book reminds me of other school stories, such as Andrew Clements's wide cannon or maybe Because of Mr. Terupt by Rob Buyea.